• PLOT SUMMARY: 'POOLPOCALYPSE NOW: CUE ARMAGEDDON The Deadpool Corps embark on the universe-spanning mission that only they can accomplish. Tapped by the Elders of the Universe to gather a crack team of his alternative universe selves for what amounts to an intergalactic suicide mission, Deadpool just can't say no. 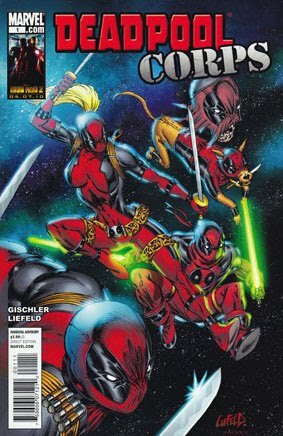 Enter: Headpool, Kidpool, Dogpool and Lady Deadpool - and it's off to the rescue, right? Not so fast. Turns out another Elder, the Champion, isn't quite sold on this new super-team. If Deadpool and crew want to streak across the universe to face the ultimate enemy, their destiny, and much needed tacos and beer, they're going to have to pass a little test first. Cover by ROB LIEFELD. Written by VICTOR GISCHLER. Art by ROB LIEFELD.